Saturday 23 March 2019, VK1 and nearby VK2 activators will kick off ‘23 on 23’, that’s 23cm on the 23rd. VK1 has 6 23 cm goats and an additional 7 active sloths. Two weeks ago I experienced my first 23 cm pileup, what a hoot. In addition to 23 on 23, a small group of VK1 activators are planning 13 on 13. I’m hoping this post will give other associations the enthusiasm to initiate a local 23 on 23 event. It would be great to see SOTA associations worldwide adopt 23 on 23. Hi Andrew, good luck with getting 23 contacts as well, then it will be 23 on 23 on 23 !! I wonder who the first person to take the new IC9700 to a sumit for a 23cm contact will be? I’m looking forward to hearing from Andrew VK1DA and Compton VK2HRX as to their 23cm plans. 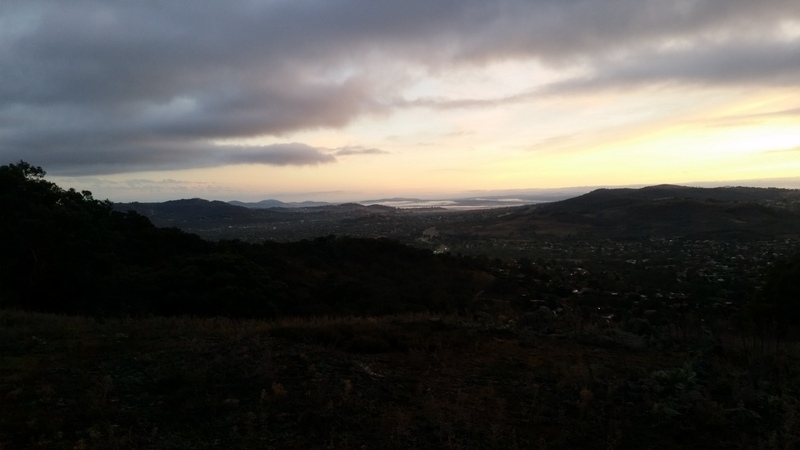 I’ll be on VK2/IL-001, Mount Gibraltar - 866m, 4 Points as soon after the Mittagong Bakery opens as I can get up the hill and set up. I’ll have HF but hope to not have to put it up. We’re adopting you into the VK1 clan, you should apply for a VK1 callsign. Great to see two North American activators KR7RK and WA7JTM are giving 23cm FM a go for 23 on 23. Mission accomplished, large flat white and a squashed fly pastry at the bakery, up the hill, set up and 23cm S2S’s with all the activators plus a few chasers. Always nice to qualify a summit with 23cm S2S’s. I think the longest one was with Jim, VK1AT at about 150KM or so. Took the IC 910H up with an 18 element yagi and pointed it to VK1 through a convenient gap in the vegetation so had a good take off and the path worked nicely. Used a Slim Jim for 2m. When is the next one? No point having all these radios if I don’t use them!! 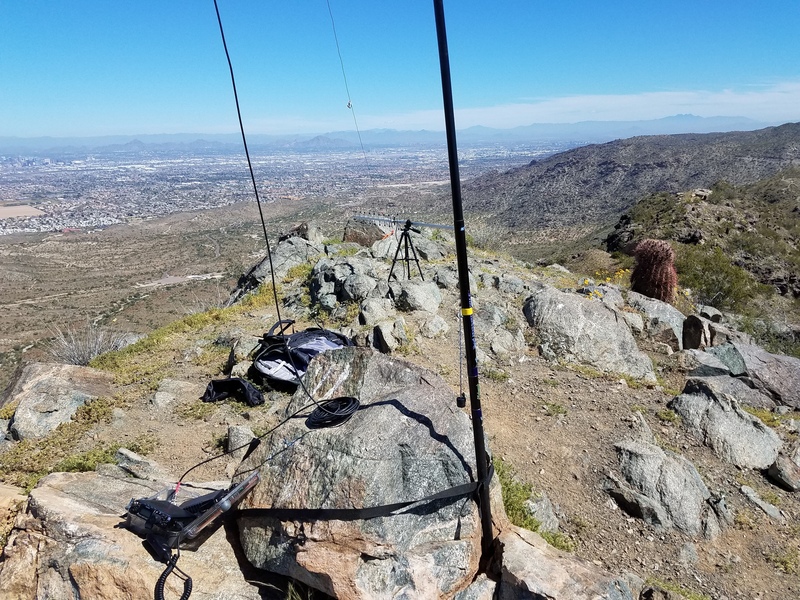 WA7JTM is responsible for the outbreak of 23 cm operations in Arizona. 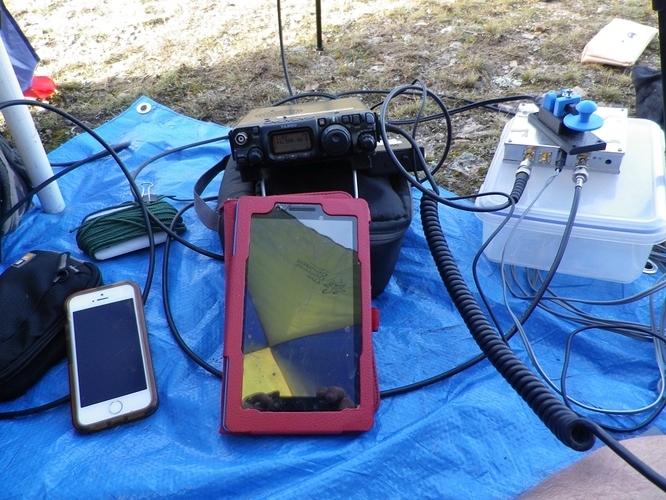 He borrowed a radio and activated a summit during the ARRL January VHF contest and started the fire. 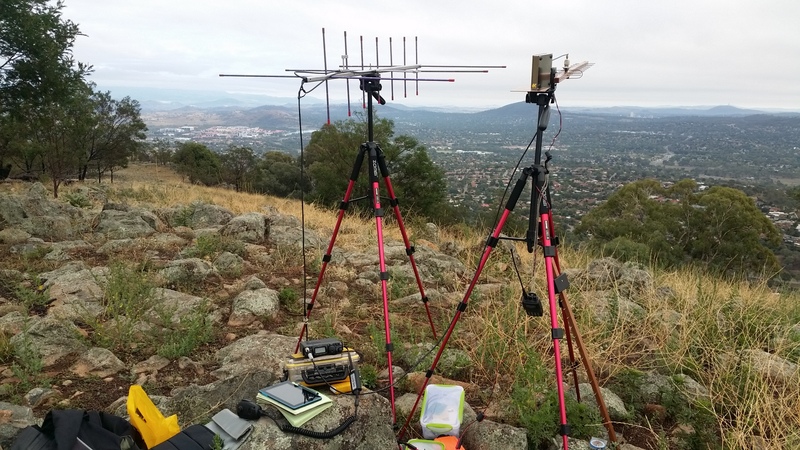 KR7RK activated and qualified 2 summits today on 23 cm on his first outing with 23cm. I qualified a third. It was a good thing because hf propagation was terrible here today. WA7JTM and I will be out tomorrow for more 23 cm fun. We have picked up 10 new activators on 23 cm since January. A very successful morning around VK1 and nearby VK2 peaks on 23cm and 13cm, but of course today’s focus was on 23cm for the 23 on 23 event. 23cm activators included; Compton VK2HRX, Jim VK1AT, Bill VK1MCW, Andrew VK1DA, Al VK1RX and myself. My unique QSO count: 23cm SSB 12 QSOs and 13cm 5 QSOs. Summit to Summit count: 23 cm SSB 5 S2S and 13cm 4 S2S. Furthest contact on 23cm SSB was Compton VK2HRX at Mt Gibraltar at a distance of 163 km (101 miles). Thanks Compton for taking the initiative to join in. In addition to the 23cm activators, Chris VK1CT joined the S2S action from Mt Majura operating on 2m 144.2 SSB and 146.5 FM. Sunrise at Tuggeranong Hill VK1/AC-038. The walk/climb takes 20 minutes to cover 1.5 km. Thanks to the North American activators who joined in for the 23 on 23 event. Well done! Will I be seeing any claims for Microwave Awards especially S2S? I have applied for the 23cm 150 km S2S award. Bill VK1MCW operating from Mt Stromlo VK1/AC-043. Bill set up his 23cm and 13cm station opposite to the former Observatory, established in 1924 but subsequently destroyed in the 2003 Canberra firestorm. As you can see from the blue sky and Bill wearing a short sleeve polo shirt the Wx was excellent. I really enjoyed my first ever 23cm QSO’s yesterday! I didn’t even realize there was a “23 on 23” event happening, it was just pure chance that my client in Phoenix decided to shorten our planned meetings, which meant I had the afternoon free to SOTA-play. I have just recently acquired the Alinco DJ-G7T, and this was its first time on 1.2. I was not disappointed, as some of the local Phoenix SOTA ops (WA7JTM, KF7NP, K7TAB, and N7AMA) gave me 4 contacts on each of the two small summits that I hiked (W7A/MN-125 and W7A/MN-131). 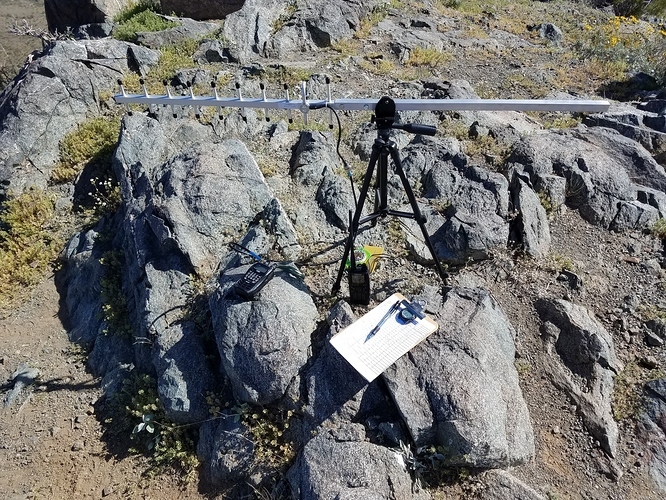 Special thanks to KF7NP for hanging out on Scarlett Mountain to give me two 1296 S2S contacts, and WA7JTM who skipped out of work to QSO on my first summit, and later in the day, climbed up on his roof to give me another on the second summit! Those Phoenix guys know how to do it! I was using the stock rubber duck yesterday, but I’ve got an ebay yagi on order, and also have plans to do some antenna building. I admire the work you guys down under have put into this band, and I’m pretty sure I’ll use some of the information you have shared regarding antennas and equipment. By the way -maybe “23 on 23” could be a Monthly happening??? 23 on 23 is practiced in some states around VK particularly on the east coast of Queensland (VK4) and to a lesser degree in VK2. 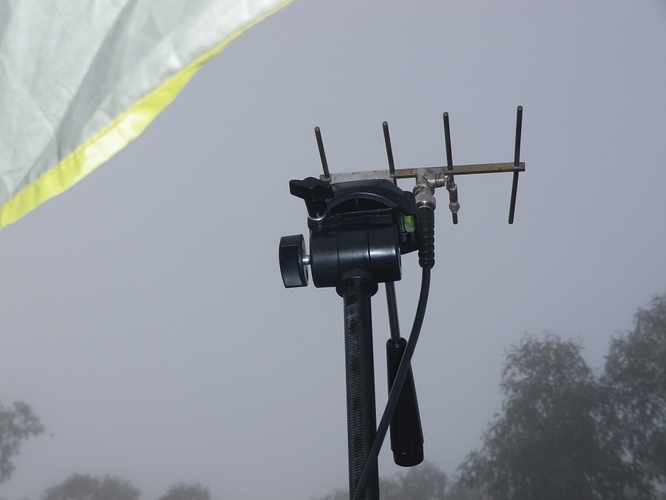 I saw ‘23 on 23’ as an opportunity to promote 23cm SOTA activations. 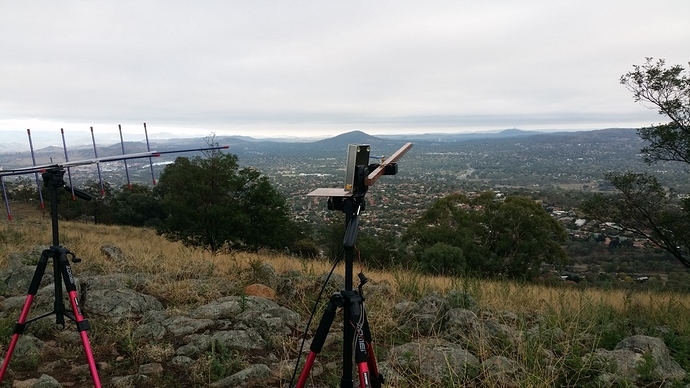 I started VK1 SOTA 23 on 23 back in February when Compton VK2HRX was visiting Canberra and he just happened to have his 23cm FM gear on hand. 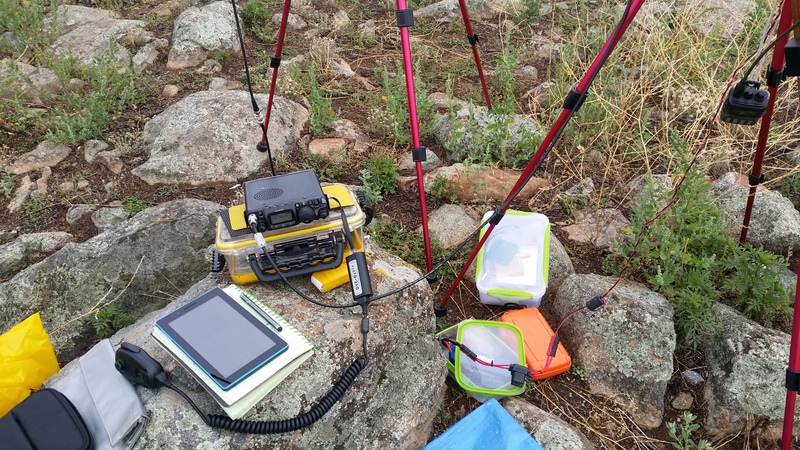 Anyway, I have proposed the 23 on 23 event as a way to capture the imagination of what you can achieve from a SOTA peak on 23cm and for activators/chasers to share their experiences with 23cm. My aim with this thread is to encourage SOTA Associations to promote their own local version of 23 on 23. For some months of the year ‘23 on 23’ falls on a week day and others on a weekend. The next 23 on 23 weekend is Sunday 23 June, personally that’s way too far away for me, I will be having 23cm withdraws. I will do my best to promote 23cm SOTA around VK. WA7JTM and I continued 23 on 23 since today was the 23rd in North America. Pete activated W7A/YV-171 Governors Peak and I activated W7A/MS-065 Goat Hill. After our s2s Pete worked 3 more stations and I worked 4 stations myself all on 23 cm. A perfect start to the day. I think we both worked an additional 5 s2s on HF before calling it a day. I used my high dollar ($37) Chinese yagi shown below. I extended the boom to help when hand holding the antenna and to help balance it on the tiny tripod. The tripod allows it to switch from horizontal to vertical quickly. Goat Hill is a tiny summit. The linked 40 meter dipoles doesn’t fit on the summit. Just past the end of the dipole there is a steep drop before the ridge continues. The other end of the 40 meter dipole actually extended over the edge and down the trail. Fortunately only 2 sets of hikers ventured to the top to visit. One set saw the antenna from a distance away and came to investigate. This picture is a 360 degree panorama with North in the center facing downtown Phoenix Arizona. 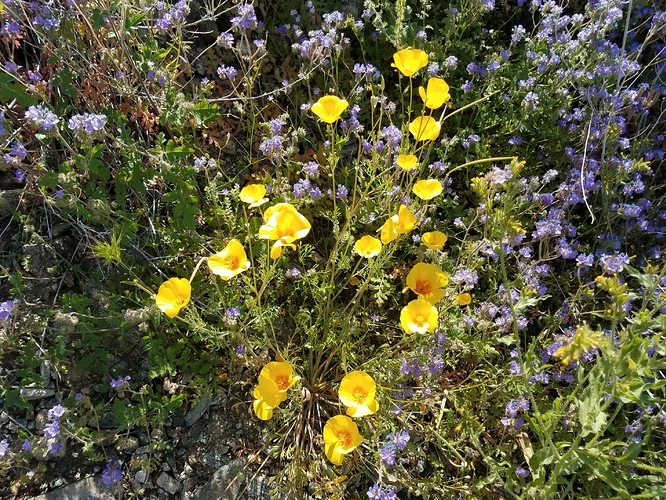 It is best viewed if downloaded and zoomed to fill the screen top to bottom. You can then scroll side to side. The link below takes you to a folder with pictures and KML tracks for some of the Phoenix summits. Look for Goat Hill. There 2 other summits in South Mountain Park. To the right is Suappoa Mount with all the TV transmitters and towers. Not user friendly. To the left across a little valley is 2555. The temperature was in the high 70s and the desert is in bloom. Nice pics. I overnighted in Phoenix on 25 Dec 2005 on a bus tour. Next stop of course was the Grand Canyon. I’d love to return on a SOTA tour one day.